So now I’ve seen two films in a row that have mucked around with conventional plot structures and I’m starting to wonder if it’s something to do with me! Am I a little too conventional? Or should I just pull my head in and remember that a sequence of two maketh not a pattern. 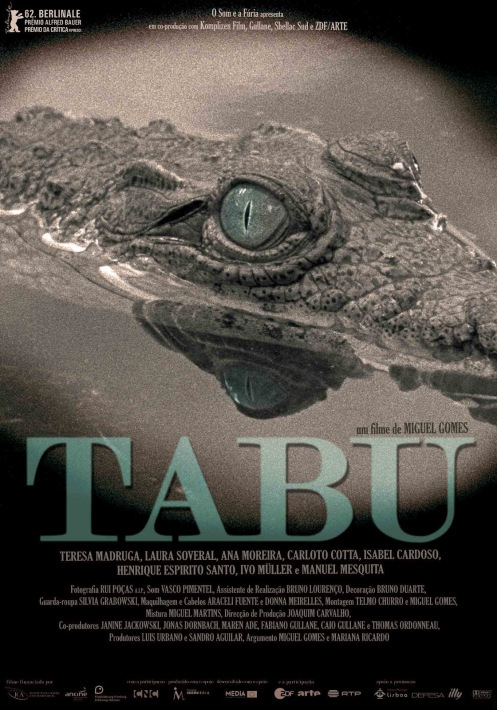 Tabu is the heart-warming story of a woman born in Portuguese Africa before a struggle for independence, but it begins by introducing her in her declining years. As the film began, in its rather confusing state, and focused on this poor woman’s dementia, I wondered if it would meander as pointlessly as The Place Beyond the Pines. It didn’t. In fact, the story completely snuck up on me, and though the tension was built slowly, I found myself completely drawn into it. I had to know how this story would play out. The characters were beautifully drawn, pawns in a political game over which they had neither any control nor any desire to exert control. It is set in modern Portugal and in the foothills of a fictitious Mount Tabu in an unidentified African colony. I could try to draw some significance by suggesting the location as Guinea-Bissau, since it is the only tropical candidate for a Portuguese African colony, but clearly the creators did not intend to make a direct correlation. The story concerns the lives of individuals in a colonial context, and though it centres on themes of colonialism, it is refreshing to engage from the perspective of the powerless colonists, rather than the powerless colonised. Ana Moreira is particularly noteworthy, and she is supported by a strong cast. Henrique Espírito Santo gives the narration for a long part, and although it was not necessary to have narration and it felt occasionally forced, it did mark the film throughout and prevent us from getting too bogged down in the emotion. This is, after all, a film for provoking thought. Themes of impotence are becoming somewhat de rigeur, perhaps, but there is something quite unique in the perspective of this film and it should be considered one of the better of them.